Born in at Forli, Italy in 1317, Marcolino Amanni entered the Dominicans at age 10. He occupies a place unique in Dominican annals because he was almost purely contemplative . There is outwardly little to record of Blessed Marcolino, except that for 70 years he kept the Dominican Rule in all its rigor. That is a claim to sanctity that can be made by very few, and is of itself enough to entitle him to canonization. He did accomplish the reform of several convents that had fallen from their primitive fervor, but this he did by his prayers and his example rather than by teaching or preaching. It is said that Marcolino was most at home with the lay brothers, or with the neighborhood children who enjoyed talking to him. He seldom went out of his cell, and could not have engaged in any active works; neither did he leave any writings. His work was the unseen labor presided over by the Holy Spirit, the work of contemplation. 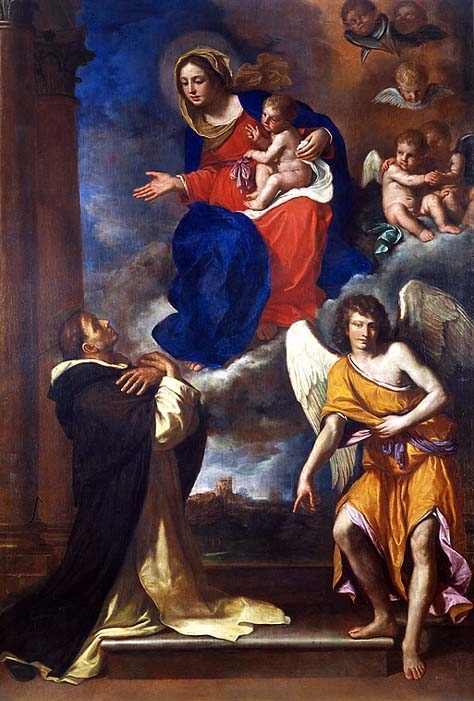 “To give to others the fruits of contemplation,” is the Dominican motto and one might be curious to know how Blessed Marcolino accomplished this. In order to understand the need for just such a type of holiness, it is well to remember the state of the Church in the 14th century. Devastated by plague and schism, divided and held up to scorn, preyed upon by all manner of evils, the Church militant was in need, not only of brave and intelligent action, but also of prayer. Consistently through the centuries, God has raised up such saints as could best avert the disasters that threatened the world in their day, and Marcolino was one answer to the need for mystics who would plead ceaselessly for the Church. The interior life of Marcolino was not recorded by himself or by others. He lived the mystical life with such intensity that he was nearly always in ecstasy and unconscious of the things around him. One of his brothers recorded that he seemed “a stranger on earth, concerned only with the things of heaven.” Most of his brethren thought him merely sleepy and inattentive, but actually he was, for long periods, lost in converse with God. Some had heard him talking earnestly to the statue of Our Lady in his cell; some fortunate few had heard Our Lady replying to his questions, with the same simplicity. At the death of Marcolino, on 2 January, 1397, a beautiful child appeared in the streets, crying out the news to the little town that the saintly friar was dead. As the child disappeared when the message was delivered, he was thought to have been an angel. Many miracles were worked at the tomb of Marcolino. One was the miraculous cure of a woman who had been bedridden for 30 years. Hearing of the death of the blessed, she begged him to cure her so that she could visit his tomb. He was confirmed as a saint in 1750 by Pope Benedict XIV.